I’m committing to doing 12 months of “101”s; posts and projects themed at beginning something new (or reasonably new) to me. January was all about node development awesomeness. February is all about Smart TV apps. 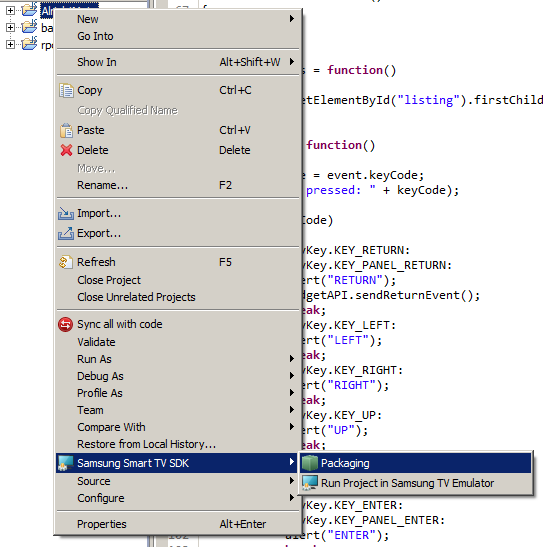 Now that we’ve got a basic Smart TV app this post will investigate how to get that app on to the TV itself. During the initial installation of the IDE you will have been asked to installed Apache; this is what it’s all been leading up to! You actually just need a web server on your home network somewhere; doesn’t have to be apache, doesn’t have to be on your developer pc. 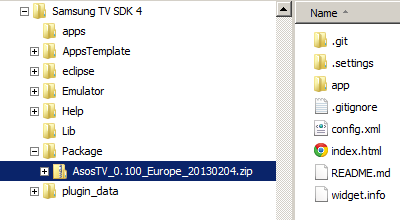 The packaging process will drop a zip file into a Widget/ subdirectory of this directory. 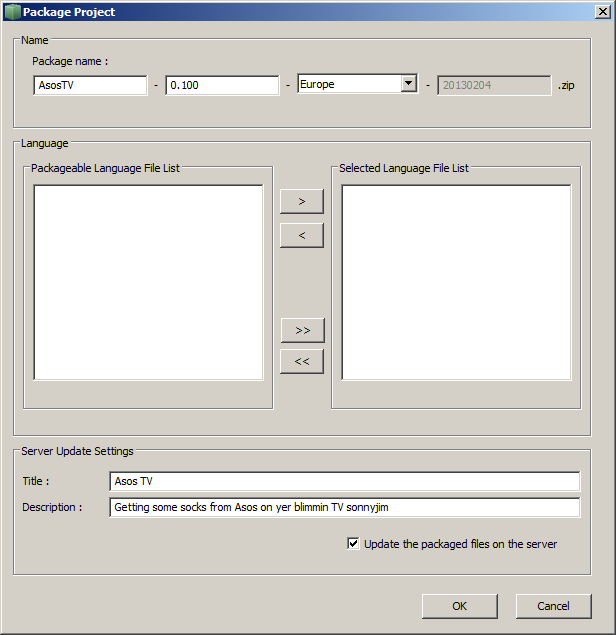 So essentially the packaging step is zipping up your project directory, putting it into a specified web server subdirectory, and updating an XML file. Obviously, you shouldn’t need an IDE or SDK to do this sort of thing and I’ll be getting on to this development & deployment process without using Eclipse or installing Apache in a later post. Now that we have a package it’s time to load it on to your Smart TV. For this post I’ll be talking about deploying from the development pc via your home network, and in a later post will be talking about loading in packages externally. Make sure your TV is connected to your network and that your development pc’s Windows Firewall is off (or at least configured to allow local network traffic). You should now find your application on the App Hub screen with a little red “user” banner over it; select it to run it, just like any other app. Summary – What was it all about? I set out to spend January learning some node development fundementals. I started with a basic intro to using node – a Hello World – which covered what node.js is, how to create the most basic of all programs, and mentioned some of the development environments. Second was creating a very simple node web server, which covered using nodemon to develop your node app, the concept of exports, basic request routing, and serving various content types. 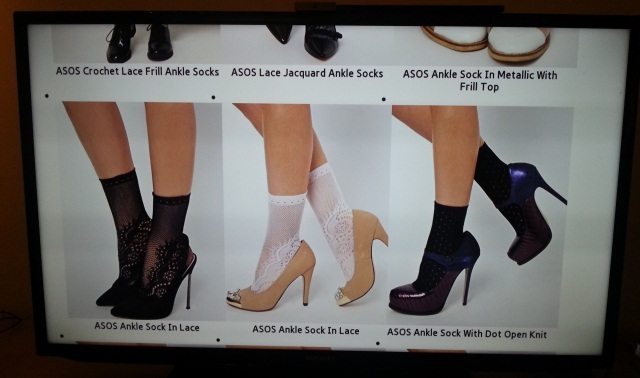 Next was a simple API implementation, where I proxy calls to the Asos API, return a remapped subset of the data returned, reworked the routing creating basic search functionality and a detail page, and touched on being able to pass in command line arguements. Possibly the most interesting and fun post for me to work on involved deploying the node code on to three cloud hosting solutions where I discovered the oddities each provider has, various solutions to the problems this raises, as well as some debugging cleverness (nice work, Heroku!). The simplicity of a git-remote-push-deploy process is incredible, and really makes quick application development and hosting even more enjoyable! Another interesting one was getting to play with node packages, the node package manager (npm), the express web framework, jade templating engine, and stylus css pre-processor, and deploying node apps with packages to cloud hosting. 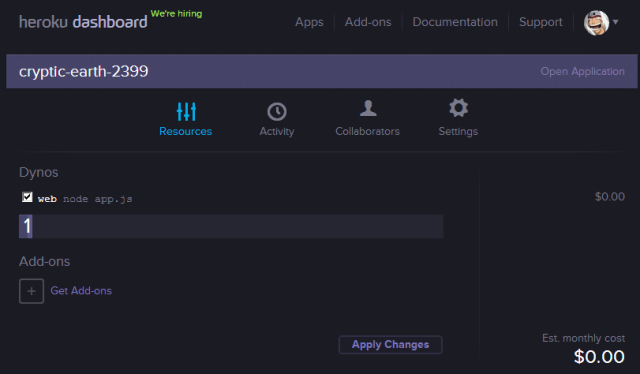 The final part covered the fantastic Cloud9IDE, including a (very) basic intro to github, and how Cloud9 can still be used in developing and deploying directly to Azure, Appharbor, or Heroku. I really got into githubbing and OSSing, and really had to try hard to not over stretch myself as I had starting forking repos to try and make a few tweaks to things whilst working on the node month. It has been extremely inspiring and has opened up so many other random tangents for me to explore in other projects at some other time. Very motivating stuff. I’ve now got a month of half decent blog posts – I had only intended to do a total of 4 posts but including this one I’ve done 7, since I kept adding more information as it turned up and needed to split a few posts into two. Also I’ve learned a bit about blogging; trying to do posts well in advance allowed me to build up the details once I’d discovered more whilst working on subsequent posts. For example, how Appharbor and Azure initially track master – but can be configured to track different branches. Also, debugging with Heroku only came up whilst working with packages in Heroku. Node Beginner – a great article, and I’ve also bought the associated eBooks. 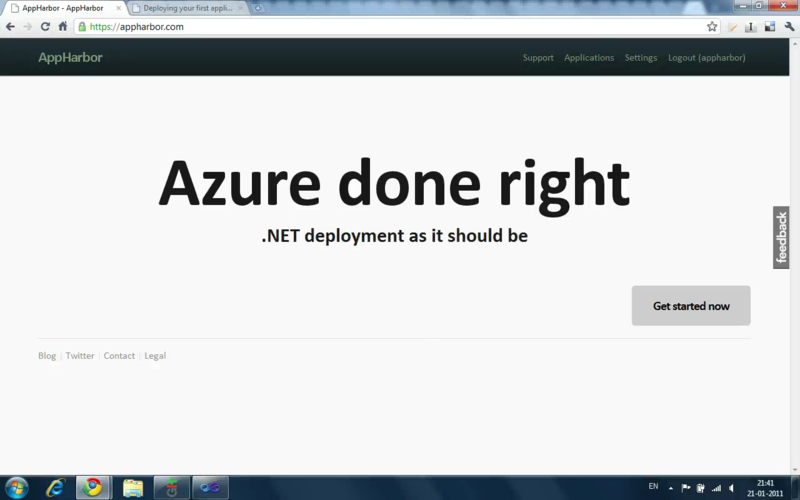 Checkout what Azure can do! 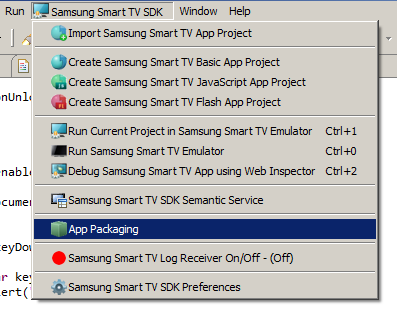 February – coming up, Samsung Smart TV App Development! In my previous posts I’ve been developing code locally, committing to a local git repo and pushing to a remote git repo. This is fine for the particular situation, but what about when I’m not at my own pc and feel the need to make some changes? Maybe I’m at my dad’s place using his netbook with no dev tools installed? Cloud9 is an incredible web-based development environment that is so feature-rich you’d usually expect to fork out wads of cash for the opportunity to use it: LIVE interactive collaborative development in the same shared IDE (see multiple people editing a file at once), code completion, syntax highlighting, an integrated console for those useful commands like ssh, git, npm. It’s frikkin open source too, so you could install it on your own servers and have your own private IDE for your own code, based in a web browser. How amazing is that? So. That’s great for my web-based development, so how about if I need to collaborate on this project with people who I’m not sharing my C9 environment with? You configure github as your git remote, push your code to it, and other users can pull, fork, edit, and send pull requests, so that you’re still effectively in charge of your own code repository whilst others can contribute to it or co-develop with you. Great. 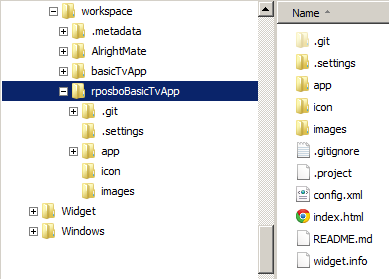 So how do I deploy my code if I’m using this sort of remote, web-based development environment? 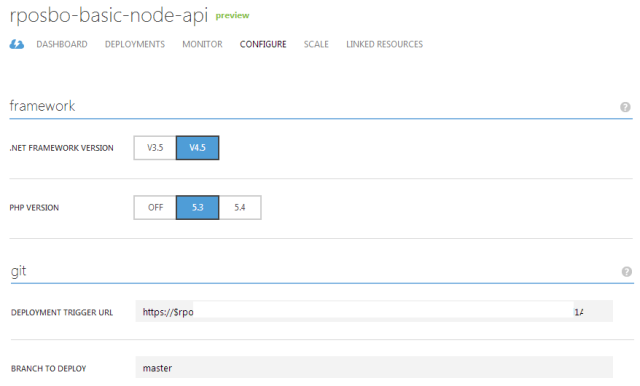 Deploying to an existing Azure/Appharbor/Azure site from Cloud9IDE is the same as from your local dev pc; set up a remote and push to it! C9 has a built in terminal should the bare command line at the bottom of the screen not do it for you. As for creating a new hosting environment, C9 also includes the ability to create them from within itself for both Azure and Heroku! I’ve actually never managed to get this working, but am quite happy to create the empty project on Heroku/Azure/Appharbor and use git from within C9 to deploy. Next post will be the last for this first month of my Year of 101s: January Wrap-Up – Node.js 101; a summary of what I’ve learned in January whilst working with Node, as well as a roundup of the useful links I’ve used to get all of the information. What’s in February’s 101?.. wait and see..! Up until now I’ve been working with node using the basic code I’ve written myself. What about if you want to create an application that utilises websockets? Or how about a Sinatra-inspired web framework to shortcut the routing and request handling I’ve been writing? Maybe you want to have a really easy to build website without having to write HTML with a nice look without writing any CSS? Like coffeescript? mocha? You gaddit. Thanks to the node package manager you can easily import pre-built packages into your project to do alllll of these things and loads more. This command line tool (which used to be separate but is now a part of the node install itself) can install the packages in a ruby gem-esque/.Net nuget fashion, pulling down all the dependencies automatically. The packages (compiled C++ binaries, just like node itself) are pulled either into your working directory (local node_modules folder) or as a global package (with the “-g” parameter). You then reference the packages in your code using “requires”. I’ve decided to write a wrapper for my basic node API using express, jade, stylus, and nib. All I’m doing is call the api and displaying the results on a basic page. The HTML is being written in jade and the css in stylus & nib. Routing is being handled by express. 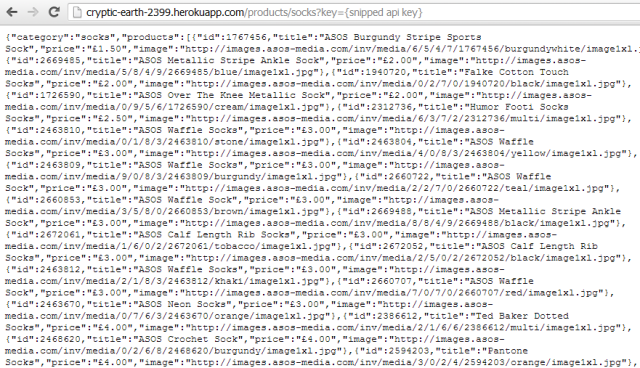 So that file sets up the express, jade, and stylus references and wires up the routes for /products/ and /product/ which then make a call using my old proxy.js to the API; I can probably do all of this with a basic inline http get, but I’m just reusing it for the time being. 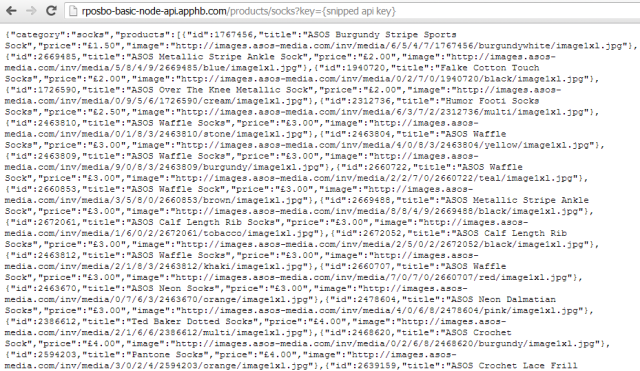 Notice how the route “/products/:search/:key” which would actually be something like “/products/jeans/myAp1k3Y” is referenced using req.params.search and req.params.key. 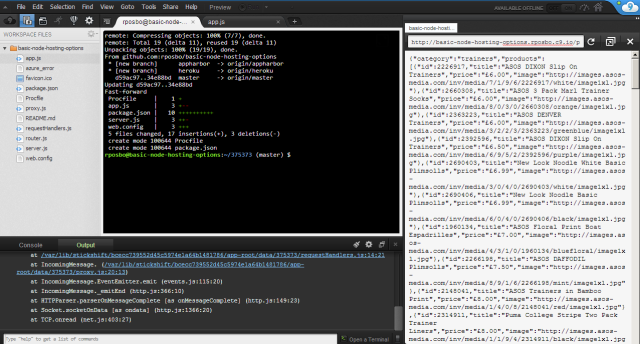 Then all I’m doing is making the API call, parsing the returned JSON and passing that parsed object to the view. And this is compiled into browser-agnostic css upon compilation of the app. 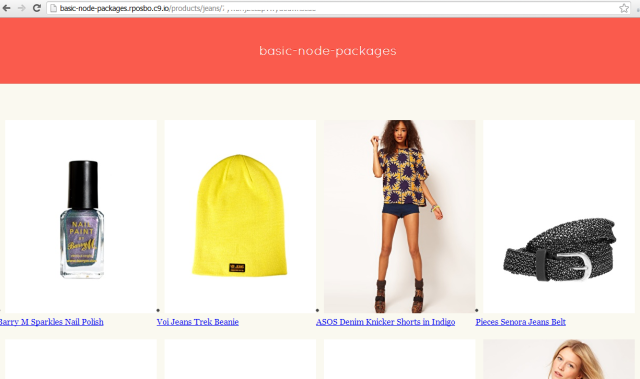 Something worth bearing in mind is that deploying something which includes packages and the result of packages (e.g. minified js or css from styl) requires all of these artifacts to be added into your git repo before deployment to certain hosts such as Appharbor and Azure; Heroku will actually run an npm install as part of the deployment step, I believe, and also compile the .styl into .css, unlike Azure/Appharbor. Web-based node development and deployment! Following on from my recent post about doing something this year, I’m committing to doing 12 months of “101”s; posts and projects themed at beginning something new (or reasonably new) to me. Working on a blog post about easy hosting options; essentially “git push [azure/appharbor/heroku] master” stretched over a few pages..
It’s not quite that easy, but it’s actually not far off! These are not the only options, but just three that I’m aware of and have previously had a play with. A prerequisite for each of these – for the purposes of this post – is using git for version control since AppHarbor, Azure, and Heroku support git hooks and remotes; this means essentially you can submit your changes directly to your host, which will automatically deploy them (if pre-checks pass). I’ll be using the set of files from my previous API post for this one, except I need to change the facility to pass in command line args for the api key to instead take it from a querystring parameter. The “.query” returns a querystring object, which means I can get the parameter “key” by using “.key” instead of something like [“key”]. git commit -m "initial node stuff"
and I could pop off for a cup of earl grey. In order to get to that point there were a few steps I needed to take for each of the three hosts. First things first; go and sign up for a free account with AppHarbor. 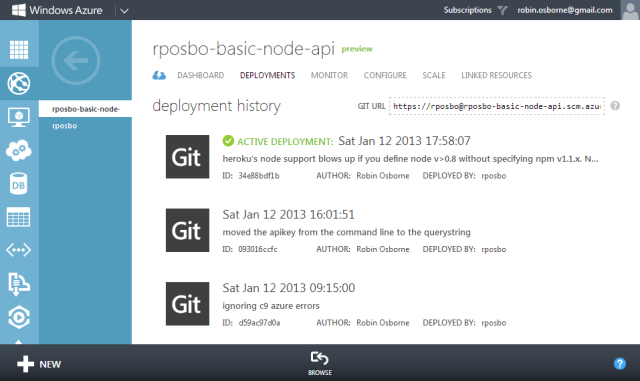 Then set up a new application in order to be given your git remote endpoint to push to. I’ve previously had a play with Appharbor, but this is the first time I’m using it for more than just a freebie host. It’s not quite as simple as I would have liked; there are a couple of things that you need to bear in mind. Although Appharbor supports node deployments they are primarily a .Net hosting service and use Windows hosting environments (even though they’re on EC2 as opposed to Azure). 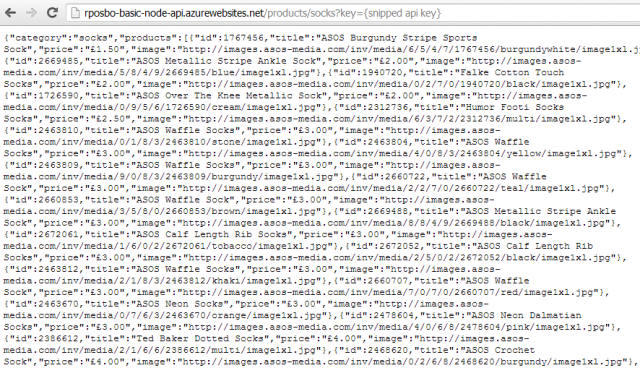 Running node within iis means that you need to supply a web.config file and give it some IIS-specific info. Most of that should be pretty straightforward (redirect all calls to app.js), but notice the lines about compilation and logging; the permissions under which the appharbor deployment process runs for node projects doesn’t have access to the filesystem so can’t create anything in a “temp” dir (precompilation) nor write any log files upon errors. As such, you need to disable these. You could also enable file system access and disable precompilation within your application’s settings – as far as I can tell, it does the same thing. Commit that web.config to your repo, add a remote for appharbor, then push to it – any branch other than master, default, or trunk needs a manual deploy instead of it happening automatically, but you can specify the branch name to track within your appharbor application settings; I put in the branch name “appharbor” that I’ve been developing against and it automatically deploys when I push that branch or master, but not any others. 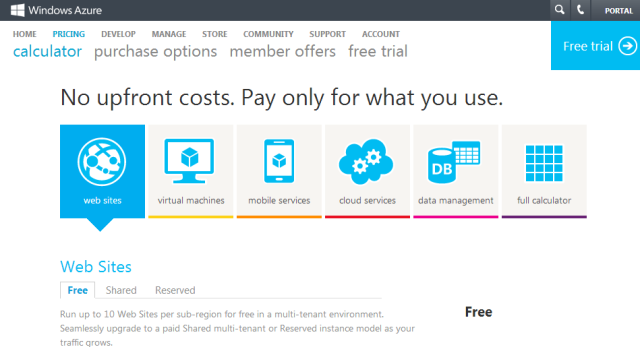 Again, first step is to go and sign up for Azure – you can get a free trial, and if you only want to host up to 10 small websites then it’s completely free. 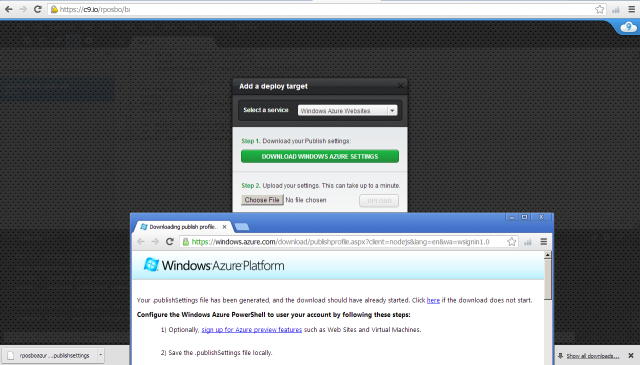 You’ll need to set up a new Azure website in order to be given your git remote endpoint to push to. This is pretty similar to the AppHarbor process in that Azure Websites sit on Windows and IIS, so you need to define a web.config to set up IIS for node. 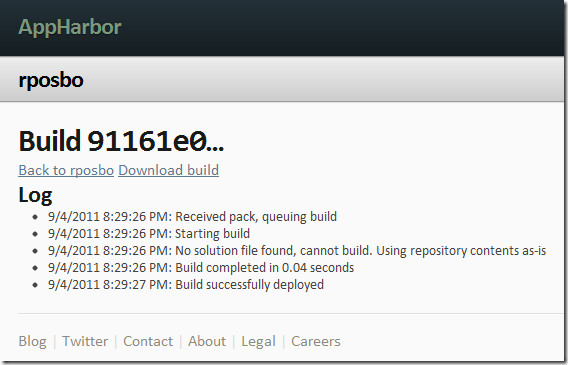 The same web.config works as for AppHarbor. 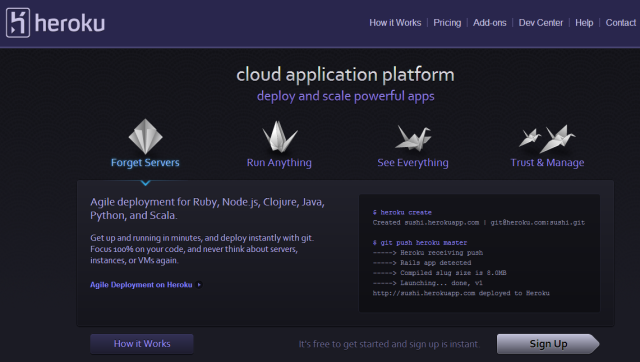 Heroku isn’t Windows based as it’s aimed at hosting Ruby, Node.js, Clojure, Java, Python, and Scala. 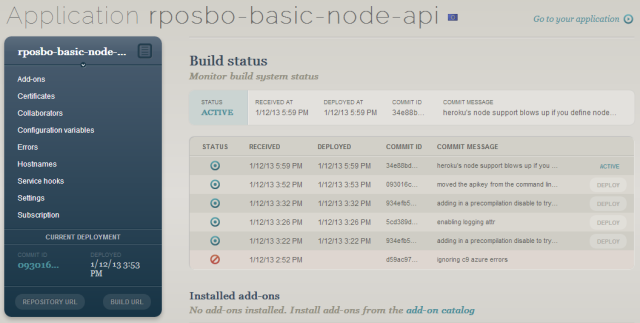 What this means for our node deployment is that we don’t need a web.config to get the application running on Heroku. It’s still running on Amazon’s EC2 as far as I can tell though. The procfile is a list of the “process types in an application. Each process type is a declaration of a command that is executed when a process of that process type is executed.” These can be arbitrarily named except for the “web” one which handles HTTP traffic. Should I want to pass in command line arguments, as in the previous version of my basic node API code, I could do it in this file i.e. There’s a command line tool which you need to install in order to use Heroku, called the Toolbelt; this is the Heroku client which allows you to do a lot of powerful things from the command line including scaling up and down, and start and stopping your application. In Heroku you do need to commit to master to have your code built and deployed, and I couldn’t find anywhere to specify a different tracking branch. 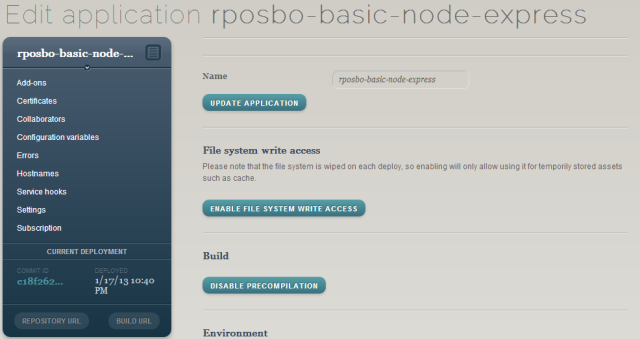 This file is used by npm (node package manager) to install the module dependencies for your application; e.g. express, jade, stylus. Even though our basic API project has no specifc dependencies, the file is still required by Heroku in order to define the version of node and npm to use (otherwise your application simply isn’t recognised as a node.js app). Something to consider is that Heroku doesn’t necessarily have the same version of node installed as you might; I defined 0.8.16 and received an error upon deployment which listed the available versions (the highest at time of writing is 0.8.14). I decided to define my required version as “0.8.x” (any version that is major 0 minor 8). However, if you define a version of node in the 0.8.x series you must also define the version of npm. A known issue, apparently. Not only that, it needs to be specifically “1.1.x”. 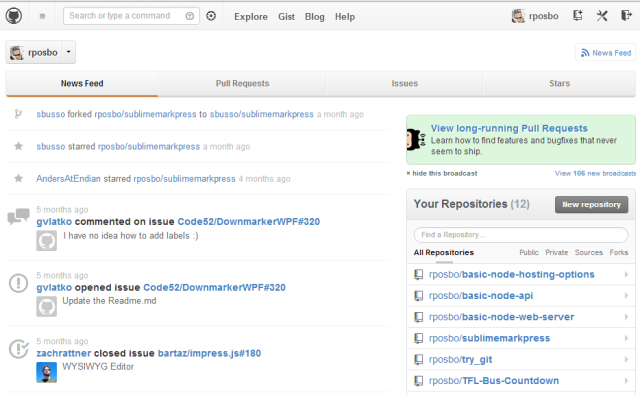 , which is amazing for debugging problems. The error codes you encounter are all listed on the heroku site as is all of the information on using the Heroku Toolbelt logging facility. Ok, so we can now easily deploy and host our API. The files that I’ve been working with throughout this post are on github; everything has been merged into master (both heroku files and web.config) so it can be deployed to any of these hosts. 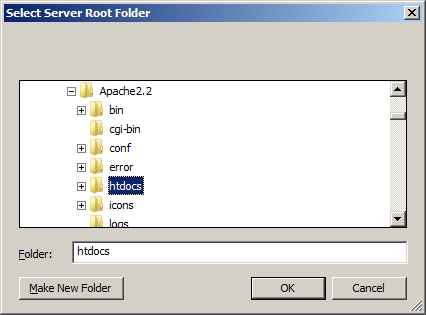 There are also separate branches for Azure/Appharbor and Heroku should you want to check the different files in isolation. The pitch: For your own small website/app you probably edit it locally on your PC, maybe you even have source control like a good dev, you’ll compile the code and then you’ll copy it to your hosting provider, probably using FTP/ via a web interface/ SCP/ SSH. Then at work you’re probably shouting about how awesome CI builds are and how to introduce continuous deployment as part of a branching and build strategy. 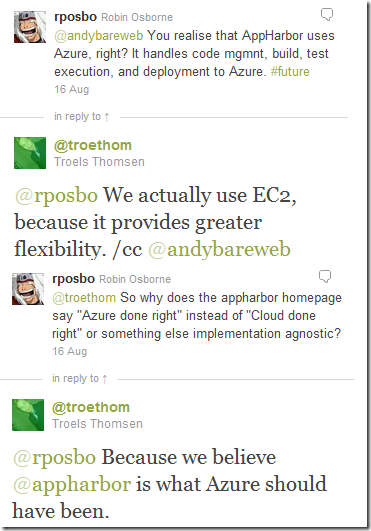 You might even use Azure or EC2 at work, maybe for your own little home projects too. Maybe you’ve learned a bit of git but your office uses TFS (ugh) or SVN (meh). So why not do this for your own stuff? For free? In the cloud? Imagine the ideal workflow: make some code changes –> commit them to (D)VCS –> push them to a (remote) repo –> the push kicks off a build the committed project (git hook) –> run any associated tests, then if they pass –> deploy the app to the cloud. So here the flow is: write some code –> commit to git –> push to Heroku –> code is built –> code is deployed. Done. “This app needs a BAKU DATABASE!! GRRAARRRR! !” Go and have a look and bask in the beautiful piccies and animations. No wonder this is (apparently) the place to go to write and deploy cloud hosted Facebook apps. Thanks to Heroku I’m finally beaing pushed to learn Ruby, but haven’t managed anything quite yet, hence no demo of the Heroku flow – wait a few more posts and I’ll have something Ruby-fied and certainly some Node.js as I’ve been meaning to get into that for a while, possibly even Clojure (sounds fun) and Java (old school!). (mine didn’t actually have anything to build, as it was a single html page and that really basic asmx web proxy I wrote). In conclusion; you now have absolutely no excuse to not write and deploy whatever applications you feel like writing. There is no hosting to worry about, no build server – it just works. 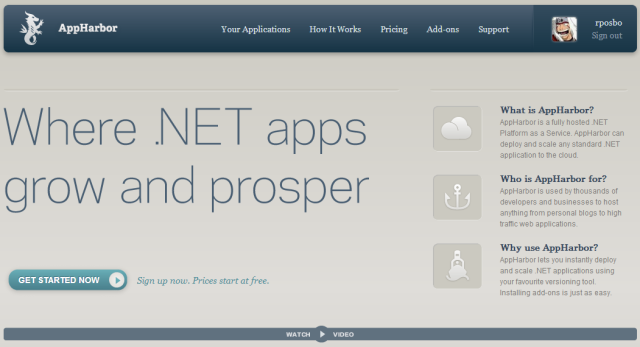 Use Appharbor for your .Net and use Heroku as an excuse to look at their pretty pictures and learn something that’s not .Net.